Hon. Peter Tom, Honoree, Hon. Karen Peters, Honoree, Hon. Janet DiFiore, Chief Judge, Hon. 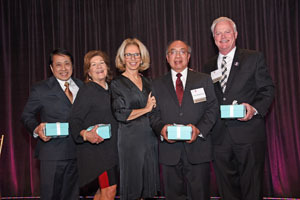 Randall Eng, Honoree and Hon. Gerald Whalen, Honoree. JALBCA held its annual dinner this year at Cipriani Wall Street in Manhattan and enjoyed the largest attendance in its history – over 650 persons – evidence of its expanded community outreach in the New York community. 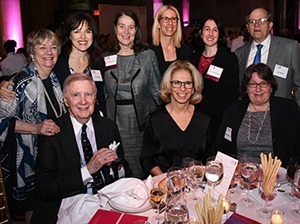 The event was organized by dinner co-chairs Richard A. Edlin and Maura Miller, assisted by an impressive planning committee and honorary dinner committee. Back Row: Patricia Hynes, Lynn Neuner, Hon. Mary Kay Vyskocil, Hon. Lynn Kotler, Hon. Jennifer Schecter, Tom Merrill. Front Row: Roy Reardon, Hon. Janet DiFiore, Mary Beth Forshaw. JALBCA’s Leadership Achievement Award was then presented by Hon. Janet DiFiore to the Presiding Justices of New York’s Appellate Divisions – Hon. Peter Tom, Hon. Karen Peters, Hon. Gerald Whalen and Hon. Randall Eng. 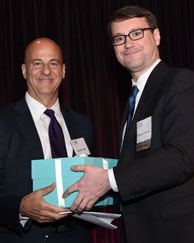 The Maite Aquino Award was presented by David Braff of Sullivan & Cromwell and accepted by Matthew Fitzwater on behalf of Barclays Global Litigation Team. 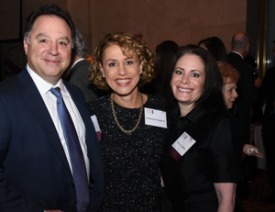 The evening also featured a tribute to JALBCA’s longtime Honorary President, Chief Judge Judith S. Kaye, and a former Co-President of JALBCA, attorney Cynthia Rubin. David Braff, Presenter and Matthew Fitzwater, Recipient of the Maite Aquino Award. Former Co-President Judith Livingston then presided over the process of obtaining generous sponsors for mobile mammography vans. This Courthouse Alert project, where JALBCA finances the uninsured or under-insured portion of the cost of hundreds of mammograms annually, performed via mobile mammography vans throughout New York City, is a signature project of the organization. In 2015-2016, JALBCA-sponsored scan vans screened approximately 1925 women, approximately 260 of which were recommended for additional medical attention or diagnosed with breast cancer. Funds for at least 50 van days were raised. To cap off the night, significant funds were raised through JALBCA’s silent auction, where many members and non-members alike donated a broad array of items. Left to right: Susan Domchek, MD, Executive Director of Basser Center and the Basser Professor in Oncology at the University of Pennsylvania, Erika Stallings, an IP associate at Kelley Drye, Kathie-Ann Joseph, MD, MPH, Associate Professor of Surgery at NYU Langone Medical Center, and Panel Moderator, Justice Barbara Jaffe. How much do you know about your family’s medical history? That was the big takeaway from JALBCA’s recent event. 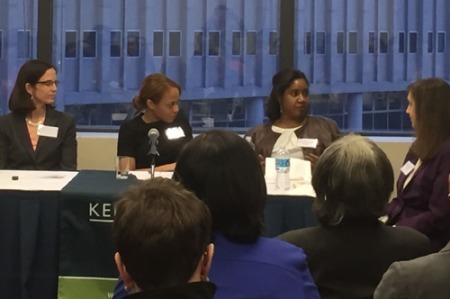 On Thursday April 14, JALBCA collaborated with Basser Center for BRCA and Kelley Drye & Warren to host a panel discussion about the genetic mutations linked to a heightened risk of certain cancers. The panel moderator, Justice Barbara Jaffe, was joined by Susan Domchek, MD, Executive Director of Basser Center and the Basser Professor in Oncology at the University of Pennsylvania, Kathie-Ann Joseph, MD, MPH, Associate Professor of Surgery at NYU Langone Medical Center, and Erika Stallings, an IP associate at Kelley Drye. The panel began with an overview of the BRCA 1 and BRCA 2 gene mutations. One bad copy of either may drastically increase the risk for cancer – up to an 80 percent increase in risk for breast cancer, up to a 45 percent increase in risk for ovarian cancer, and up to a 25 percent increase for prostate cancer. The increased risks affect men as well as women and there is a 50 percent chance of passing the mutation to children through the genes of either the father or the mother. The panelists then discussed the options available to reduce the risk, including preventative surgeries, such as the removal of the ovaries and a prophylactic mastectomy. Decisions as to whether to undergo surgery or any other method of reducing the risk are universally understood to be difficult. Drs. Domchek and Joseph thus urged that they be made after in-depth consultations not only with doctors but with genetic counselors. Ms. Stallings, a young breast cancer survivor and beneficiary of genetic testing and counseling, generously shared her experiences and is a vocal advocate of genetic testing. The discussion then moved to the legal issues regarding BRCA 1 and BRCA 2. The panel discussed the Genetic Information Non-Discrimination Act of 2008, which prevents employers and health insurance companies from denying an individual insurance and employment because of genetic information. This Act was amended in 2013 to provide additional protection by including genetic information within HIPAA. This area continues to evolve as the country shifts towards personalized medicine. Patients should understand that, because physicians have a duty to warn families about genetic information, they must ensure that their patients know that their family members should be warned about the patient’s genetic information that pertains to his or her family members. As genetic testing becomes more commercial, the duty expands. The commercialization of genetic testing is rapidly changing the field. After the United States Supreme Court’s decision in Association for Molecular Pathology v. Myriad Genetics (133 S.Ct. 2107 ), denying a patent for isolating naturally occurring DNA, many more companies began testing and researching genetic information. With so many companies conducting these tests, it is important for patients to see a genetic counselor, not only for insurance purposes, but also for more complete explanations. Many insurance companies do not accept a doctor’s note for covering such tests, but accept the recommendations of a genetic counselor. Furthermore, genetic counselors are best trained and equipped for walking patients through the information they seek and receive. As a final segment of the program, the topic turned to popular culture and how it has altered the discussion. This talk centered on Angelina Jolie and her open discussion about her double mastectomy due to a BRCA mutation. While the panelists believed that Jolie’s public actions brought the issue into the public eye, they denied that it had the intended effect. While more people are willing to undergo the surgery, there is an increasing number of people asking for the surgery who do not need it. Thus, it is important that the public understand that the so-called “Angelina Jolie surgery” may not be the best course of action in an individual case. The need genetic counseling is essential. By the end of the evening, the panelists agreed that knowing your personal family health history is key to taking the preventative measures needed to reduce the risk of cancer and that genetic testing can be extremely valuable and important to help people be proactive about dealing with cancer. Vice-President Joe Biden’s “Moonshot to Cure Cancer” can only be possible by increasing our knowledge and ensuring we take the right steps to reduce our risks of cancer. Breast tomosynthesis, also known as 3D mammography, was approved by the FDA in February 2011. It is a screening and diagnostic breast imaging tool to improve the early detection of breast cancer. During the 3D part of the exam, an x-ray arm sweeps over the breast, taking multiple images in seconds. Images are displayed as a series of thin slices that can be viewed by radiologists as individual images or in a dynamic interactive animation. Studies show 3D mammography to be more accurate in finding breast cancer. It reduces detection challenges associated with overlapping structures in the breast, the primary drawback of conventional 2D mammography overlapping tissue makes it difficult for the radiologist to differentiate a real lesion from normal overlapping tissue. Tomosynthesis also has been found to reduce the number of false positive readings. In the recent large study of tomosynthesis in breast cancer screening published in the Journal of the American Medical Association, the authors found a significant (41%) increase in the detection of invasive cancers with a simultaneous decrease in false positives. Observational studies also report that breast tomosynthesis was associated with a significant reduction in recall rates. The FDA requires that 3D mammography be performed in conjunction with standard 2D mammography. In May 2013, the U.S. FDA approved Hologic’s C-View 2D imaging software which generates the 2D images directly from the 3D dataset and avoids the need to take the second mammogram, i.e., the need for the 2D exposures. The C-View 2D image can be used in the same way as an acquired 2D image is used, i.e., it facilitates comparison of earlier 2D images, judging left-right asymmetry, and assessing the distributional aspects of calcifications. The radiation dose for the 3D plus C-View procedure is similar to that of 2D mammography. A further benefit is that the combination of Hologic’s 3D and C-View 2D images results in less time under compression for greater patient comfort, because the process eliminates the 2D exposure. Hologic also incorporated tomosynthesis into another aspect of breast cancer detection, which allows radiologists to perform a needle biopsy of a suspicious finding that can only be seen with 3D imaging, i.e., a tomosynthesis-guided biopsy. This allows radiologists to use the same modality for detection of abnormalities and localization for biopsy.